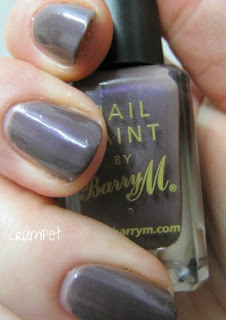 The Crumpet: Barry M DUSKY MAUVE - Perplex Dupe ?? So, this is unusual. This has a 2 word name (which admittedly describes what it is) but which also sounds like a name any other brand would have come up with ? Oh Barry, you disappoint me! 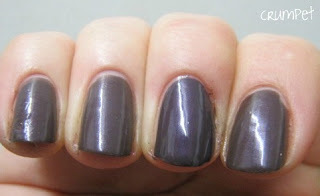 Welcome to Dusty Mauve, which may or may not be a Perplex dupe (I will do you a comparison later). This is an amazing colour, and really quite indefinable. Er, how am I going to do this ….? Ok, here goes …. This is a murky, sludgy swampy purple, a grey-brown purple, a porridge purple. There is no warmth, but there is smokiness and dustiness. 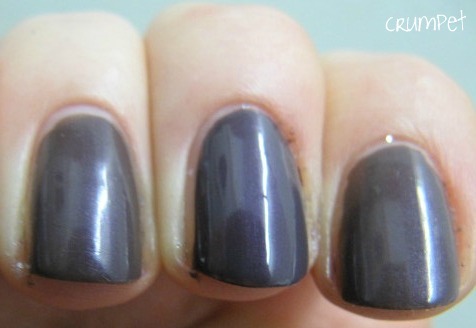 This is brown AND grey without being either, and has a subtle purple shimmer threaded through it. It’s like cabbage soup, made with purples. Yikes! What you need to know is that this is a damn cool colour, a rare colour, and a “what are you wearing” colour. I love it, and I think I’ll be wearing it loads. What you can really see in the bottle (but less so on the nail) is a lovely violet shimmer swirling on top of the polish like a layer of fairy scum – this actually reminds me of pigeons. Pigeons ? Yes, bear with. You know how when you look at a pigeon and you see the grey, but then there’s also a lilacky sheen going on on their feathers ? Like that. Now let’s see how Perplex compares …. Can you tell which one it is, can you ? At a casual glance, they are spot on dupes, but up close you can tell Perplex has a little less brown and a little more purple to it. Close, but not exact. Did you spot it ? It’s the middle finger. Whichever of these polishes you own, they are both a joy, and perfect for dark rainy weather.